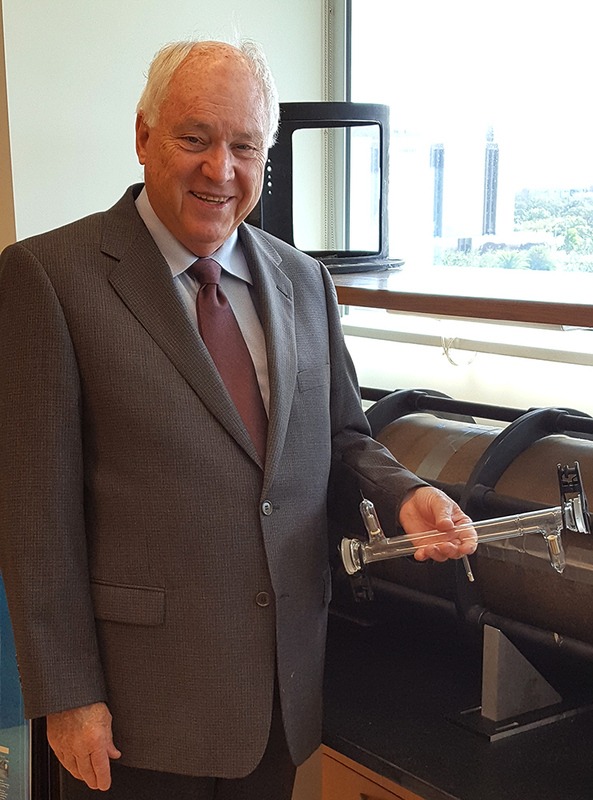 TAMPA, Fla. — The National Academy of Inventors on Tuesday named USF Physics Professor Emeritus Dennis K. Killinger, a pioneer in the use of lasers and optical remote sense as scientific tools, and USF Institute for Advanced Discovery & Innovation Professor Donald Keck, whose work in developing fiber optics laid the groundwork for the internet, as 2017 Fellows. Election to NAI Fellow status is the highest professional accolade bestowed solely to academic inventors who have demonstrated a prolific spirit of innovation in creating or facilitating outstanding inventions that have made a tangible impact on quality of life, economic development, and welfare of society. The NAI named 155 distinguished academic inventors to the 2017 class. USF is the founding institution of the National Academy of Inventors. Killinger is a USF Distinguished University Professor Emeritus of Physics and past Director of the Lidar Remote Sensing Laboratory in the College of Arts and Sciences, and is known internationally for his work in laser and optical remote sensing, laser radar/Lidar, applied laser spectroscopy, laser physics, and Free Space Optical (FSO) laser communication. He is also President and CEO of SenOptics, which develops atmospheric laser communication and lidar sensors for driverless vehicles. Killinger was one of the early pioneers in the field of tunable laser development, high-resolution laser spectroscopy and laser remote sensing more than 40 years ago. He is responsible for some of the major advances in this field, including the first laser remote sensing and mapping of methane, CO, NO, ammonia, and CO2 in the atmosphere, the detection of trace plastics (BPA) and organics leached into drinking water, and remote laser-induced-breakdown spectroscopy of explosives. Killinger’s lidar technique to measure CO2 in the atmosphere is now used by NASA and NOAA for global measurements of this important greenhouse gas. He also established at USF the first vehicle traffic laser radar testing laboratory in Florida at the request of the Florida Highway Patrol, and developed and commercialized the HITRAN-PC © software program used world-wide for analysis of light and laser beam transmission through the atmosphere. He is the author of the Atmospheric Optics for the Handbook of Optics and the “History of Laser Remote Sensing, Laser Radar, and Lidar” for the Optical Society of America (OSA). 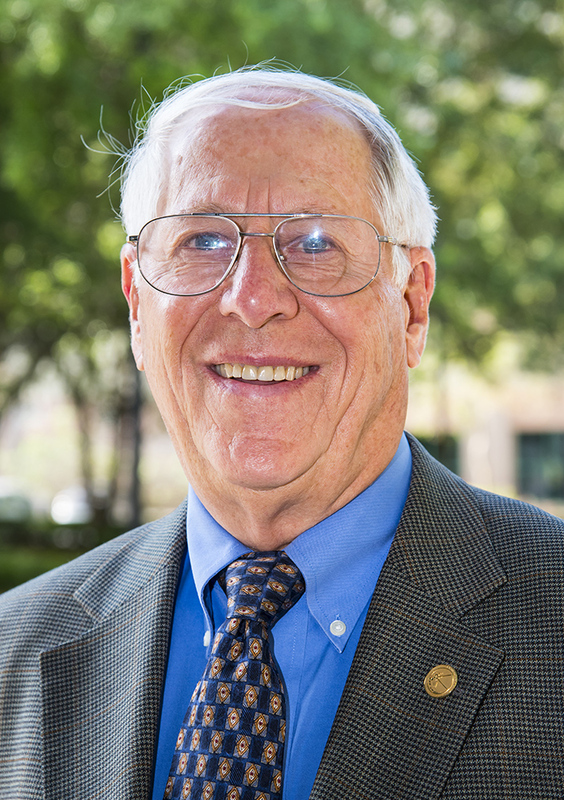 Killinger, who is a founding member of the USF Chapter of the NAI and served on its Executive Committee, has also served during his career as a member of the National Academy/NRC Committee on Optical Science and Engineering (COSE) to assess the future technology trends in optics and lasers titled Harnessing Light: Optical Science and Engineering for the 21st Century. He also served as associate editor of Applied Optics and Optics Letters, and has been chair/co-chair of more than 20 Laser and Optics international conferences. He is a Fellow of the OSA, Fellow of the American Association for the Advancement of Science (AAAS), Fellow of the Photonics Society (SPIE), and Senior Member of the Institute of Electrical and Electronics Engineers (IEEE). He has eight patents and several hundred publications. Killinger earned a bachelor of arts from the University of Iowa, a master of science from DePauw University, and his Ph.D. from the University of Michigan. Keck is a professor in USF’s Institute for Advanced Discovery & Innovation, which brings together internationally recognized senior leaders — academics, industry heads, and innovators from diverse fields — to advise the administrative leadership of the university, share insights with USF's faculty and mentor students. Keck is a leader in the Institute’s “Get Innovative” class at the USF Honors College and guides students through the process of innovation and discovery. Keck retired in 2002 as vice president and executive director of research at Corning, Inc. It was at Corning where Keck worked with Robert Maurer and Peter Schultz to invent the seminal materials and process technology and demonstrate the first practical low-loss optical communications fiber. Their work enabled today’s high-speed optical fiber communications network, without which the Internet would not exist. More than 3.7 billion kilometers of optical fiber based on their inventions now encircle the planet. Keck holds 38 patents and has authored more than 150 papers on optical fibers and related topics. Among his many honors are the National Medal of Technology from President Clinton; induction into the National Inventors Hall of Fame; the John Tyndall award from the OSA and the IEEE Photonics Society; the U.S. Department of Commerce American Innovator Award; the SPIE Technology Achievement Award; and Laurin Publishing's Distinction in Photonics Award. He has an honorary doctorate from Rensselear Polytechnic Institute. He is an honorary member of OSA, and a fellow of the Institute of Electrical and Electronics Engineers (IEEE). He served as editor of the IEEE/OSA Journal of Lightwave Technology and generously donated his time to the OSA community. After retirement, Keck helped established the Infotonics Technology Center in Canandaigua, N.Y. He holds a bachelor of science, a master of science and a Ph.D. in physics from Michigan State University. With the election of the 2017 class there are now 912 NAI Fellows, representing over 250 research universities and governmental and non-profit research institutes. The 2017 Fellows are named inventors on nearly 6,000 issued U.S. patents, bringing the collective patents held by all NAI Fellows to more than 32,000 issued U.S. patents. On April 5, 2018, the 2017 NAI Fellows will be inducted as part of the Seventh Annual NAI Conference of the National Academy of Inventors at the Mayflower Hotel, Autograph Collection in Washington, D.C., U.S. Commissioner for Patents Andrew H. Hirshfeld will provide the keynote address for the induction ceremony. Those elected to the rank of NAI Fellow are named inventors on U.S. patents and were nominated by their peers for outstanding contributions to innovation in areas such as patents and licensing, innovative discovery and technology, significant impact on society, and support and enhancement of innovation. The 2017 class of NAI Fellows was evaluated by the 2017 Selection Committee, which included 18 members comprising NAI Fellows, U.S. National Medals recipients, National Inventors Hall of Fame inductees, members of the National Academies of Sciences, Engineering, and Medicine and senior officials from the USPTO, National Institute of Standards and Technology, Association of American Universities, American Association for the Advancement of Science, Association of Public and Land-grant Universities, Association of University Technology Managers, and National Inventors Hall of Fame, among other organizations. The 2017 NAI Fellows will be highlighted with a full page announcement in The Chronicle of Higher Education 19 Jan. 2018 issue, and in an upcoming issue of Science and Technology and Innovation, Journal of the National Academy of Inventors. The National Academy of Inventors is a 501(c)(3) non-profit member organization comprising U.S. and international universities, and governmental and non-profit research institutes, with over 4,000 individual inventor members and Fellows spanning more than 250 institutions worldwide. It was founded in 2010 to recognize and encourage inventors with patents issued from the U.S. Patent and Trademark Office, enhance the visibility of academic technology and innovation, encourage the disclosure of intellectual property, educate and mentor innovative students, and translate the inventions of its members to benefit society.